Which Type of Outdoor Cooking Should You Choose? There are SO many different ways to cook outdoors. Outdoor cooking is fun, but figuring out which type is best for you can be tricky at first. It doesn't have to be! Most forms of grill and fire pit cooking are fun, easy and will let you make delicious grilled or roasted food. Each does have particular advantages and disadvantages though. Some are good for one type of cooking and not as good for others. This list of the pros and cons of each should help you choose for yourself. Which type of outdoor cooking does the Fire Pit and Grilling Guru prefer? I use them all! It just depends on what I'm cooking and the mood I'm in. This is the classic outdoor cooking grill. It is the gold standard for outdoor cooking for many grill lovers. It is versatile and easy to use. Simple - Charcoal is easy to find, relatively easy to light and you don't need any other special accessories or fuel. You basically just start your coal fire and start cooking. Besides a wood fire grill, this is one of the most basic and traditional forms of outdoor cooking. While control of heat is not as easy as gas, a good charcoal grill has great control of temperature from low smoking temps to high searing heat. A wood fire is harder to control. Versatile - Despite its simplicity, a charcoal grill is versatile and can pretty much cook any type of outdoor cooking grilled foods. From direct heat searing to indirect heat roasts and even rotisserie and smoker cooking, charcoal can do it! Great Flavors - No doubt about it, a real hardwood fire with nice embers and charcoal supply the best wood smoke flavors to your food. While pressed charcoal briquets can have additives and "off" flavors, real lump hardwood charcoal gives just pure, natural wood flavors. You can also easily add chips or chunks of smoking woods to add particular flavors like mesquite, hickory, maple or others. 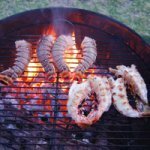 Choice of Fuels - While basic pressed charcoal briquets are easy to find at any supermarket, there are a whole selection of other types of charcoal available. In particular, lump charcoal, made from real chunks of hardwood without any additives, supplies great heat from a natural source with great natural wood smoke flavors. 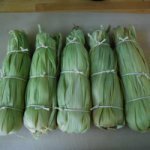 They are available in many types and from many sources and are one of the best ways to improve your outdoor cooking. Inexpensive - In general, charcoal grills are less expensive than their gas or natural gas grill counterparts. While there are expensive ones out there, such as the awesome Big Green Egg, many of the best charcoal grills, such as the Weber kettle grills, can be found for very inexpensive. Messy - Yes, charcoal can get a bit messy, dirtying your hands and clothes. And it leaves a bunch of ash which you need to clean up before your next outdoor cooking grilling session. A Bit Slower to Start - While charcoal takes longer than a gas grill to get started and ready for cooking, with a little practice and a good charcoal starter like the charcoal chimney your charcoal can be hot and ready in minutes. Another classic type of outdoor cooking that you see used very frequently. Many outdoor chefs love the speed, power and ease of outdoor cooking on a good gas grill. Easy - No messy charcoal, no difficulty starting, a gas grill gets started up fast and easy, usually with the turn of a knob and the press of a button. No messy ash to clean up either. Features - Many gas grills have features available that aren't seen on many charcoal grills. For example, many gas grills have optional side burners so that you can cook sauces, stews and soups on your grill while barbecuing the rest of your food. Natural Gas and Infrared Options - Nowadays natural gas is all the rage in outdoor cooking. Most gas grills either come in natural gas models or can be easily converted to natural gas if you want a clean and easily available source of fuel. Many new gas grills also have optional infrared burners which supply an intense heat source for high heat searing of foods. Lack of Wood Smoke - Gas grills in and of themselves do not create any wood smoke flavor to enhance your food. In fact, some people even feel that the gas gives some strange flavors to the food. The intense heat and grill grid do help create the nice caramelized golden surface on your grilled foods which adds flavor, but if wood smoke flavors are what you desire, the gas grill does not have it. The solution to this problem is getting a metal smoker box (included on many gas grills) which allows you to add lumps of smoking woods which give off rich smoke to flavor your outdoor cooking food. While this is not quite as good as a real wood fire, it does the job pretty well. Liquid Propane Tank Refilling - A propane gas grill requires occasional filling. When outdoor cooking, this can be a pain to lug around a big tank of propane and find a place to refill it. It is also an extreme pain if you run out of fuel in the middle of a party! Buy a back-up tank or check your tank regularly to make sure this doesn't happen to you! Maybe you didn't know this was an option. A natural gas grill means you'll never run out of fuel in the middle of your outdoor cooking again! No Running Out of Fuel - A natural gas line (the same gas line that supplies your kitchen stovetop and oven) supplies constant, never-ending fuel to your natural gas grill (unless you forget to pay the gas bill!). No more heavy propane tanks or running out to refill. You are plugged in to a constant supply of fuel for your fire. Inexpensive Fuel - Compared to propane, natural gas is less expensive per BTU of heat supplied. Its More Green! - Natural gas burns cleaner than propane. Therefore it is theoretically better both for the environment as well as for your heath! 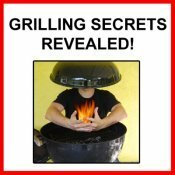 All the Advantages of a Gas Grill - All the other advantages of a gas grill discussed above (easy and speed of use, infrared burners, side burners, etc.) apply to a natural gas grill as well. Lack of Wood Smoke - Just like a propane gas grill, in order to cook with wood smoke flavor, you'll need to supply a smoker box with smoking wood chunks. Natural gas does not flavor your food on its own. Installation - These grills do require a natural gas line outlet near your grill and may require special installation. If you don't have a line near your patio or backyard this may be costly and difficult. A specialty grill for slow smoking foods for a unique and rich flavor. Wood Smoke Flavor - Smoked foods have an intense wood smoke aroma and flavor which is delicious and accompanies many foods beautifully. The most intense smoked flavors come from slow cooking on a closed smoker which literally baths your food in waves of rich wood smoke flavor. Long, Slow Roasting - Smoker grills are specifically designed for slow outdoor cooking at low temperatures. This allows you to slowly roast almost any cuts of meat, from small strips to whole roasts of poultry, over a long time, even hours, while slowly creating a rich smoke flavor throughout the meat. The result is succulent, savory roasts which are perfectly cooked through with rich smoke flavors. Not as Versatile - A dedicated smoker is specifically designed for slow smoking meats. Most are not as versatile for cooking other types of barbecue and grilled foods. Most Smoking Can Be Accomplished with a Good Gas or Charcoal Grill - You generally don't need a dedicated smoker grill to make smoked foods. Either a gas or charcoal grill can be used at low indirect heat to slowly cook your food while using smoking wood chunks to supply the savory smoke. Doubles as an Outdoor Fire Pit - A fire pit grill is basically a fire pit which has the ability to hold a grill grate over your wood fire or embers. This means that a wood grill can be used both as a fire pit, to sit around and enjoy the heat and ambiance, as well as a wood fire grill for cooking food over real wood embers. Firewood Cooking - This is one of the most basic and ancient forms of cooking. Cooking over a real hardwood fire or embers is the ultimate in natural wood smoke flavor. Large Size - Most fire pit grills are larger than your average charcoal grill allowing you to cook more food at the same time. Versatility - Cooking over a real wood fire allows you to both cook over high direct heat and to slowly roast foods. With a rotisserie apparatus you can slowly roast whole poultry or other roasts over your fire for even, thorough cooking. Skewer Cooking - Some smaller food items are ideally cooked on a skewer over an open fire. The classic example is roasting marshmallows and making s'mores. But other foods can be cooked on skewers (hot dogs, sausages, small game birds, etc.) allowing your guests to get in on the outdoor cooking! Longer Set Up - A real firewood fire takes longer than even charcoal to get started. Additionally, most grilled foods are best cooked over embers, not the initial flames. Therefore it takes longer to get the fire started and burn the wood down to a nice bed of embers to cook over. If you are in a rush then firewood outdoor cooking is maybe not for you. Availability of Firewood - Depending on where you live, good firewood for cooking may not be easily available year-round or may be expensive during parts of the year. If firewood is easily accessible to you, then cooking over a wood fire may be ideal. If it is expensive and hard to find, then you may have to settle for charcoal or gas. Intense Heat, Less Time - While wood embers supply an intense direct heat, they generally last shorter than charcoal (and certainly shorter than gas). Therefore you have to time your cooking just right and it may be hard to slow cook bigger roasts unless you have a rotisserie apparatus. One of the newest technologies in outdoor cooking. Perfect seared foods every time! Intense Heat - An infrared grill burner directs the heat from a gas burner onto a ceramic tile which then converts the heat into infrared energy which radiates off the tile onto your food. This is a super intense source of heat which is capable of easily attaining very high temperatures which are hard to reach with charcoal or normal gas grills. Ideal for Searing - This high intense direct heat is ideal for searing cuts of meat quickly, locking in juices. You get a piece of meat which is nicely browned on the outside while staying succulent and juicy on the inside. Many chefs prefer these burners for cooking a perfect steak. Lack of Wood Smoke - Like a gas grill, these burners don't supply any wood smoke flavors if that is what you desire. You cannot really add a smoker box directly to the infrared burner, so at most you may get a small amount of smoke for an adjacent smoker box on the gas grill the burner is on. Not as Versatile - These burners are really meant for high heat searing, cooking the outside and keeping the inside fresh and less cooked. This is ideal for a rare or medium-rare steak, but not so much so for a larger cut of meat or meat which must be cooked through completely. A chicken breast for example would probably be totally burnt on the outside before the inside was done. Some infrared grills have a wider range of temperature control, allowing you to cook more delicate meats like fish fillets or fish steaks, so make sure you look into the specific model you are buying. You got all that? I hope it helps you make the decision as to which is best for you. If all else fails, do what the Fire Pit and Grilling Guru does...buy one of each! Done learning about the different types of outdoor cooking? 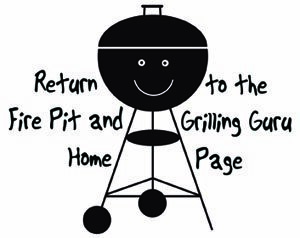 Return to the Grill Cooking page.